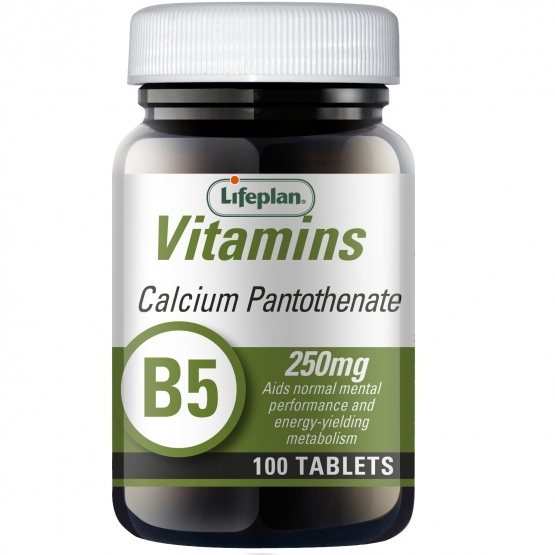 These tablets provide high strength Pantothenic Acid (Vitamin B5). Pantothenic acid contributes to normal energy-yielding metabolism, normal mental performance and contributes to the reduction of tiredness and fatigue. Pantothenic acid contributes to normal synthesis and metabolism of steroid hormones, vitamin D and some neurotransmitters. INGREDIENTS: Bulking Agent (Microcrystalline Cellulose), Vitamin B5 (Calcium D-Pantothenate), Crosslinked Sodium Carboxy Methyl Cellulose, Stearic Acid*, Anti-caking Agent (Silicon Dioxide). Calcium Pantothenate (Vit B5) x100 has been added to your basket.